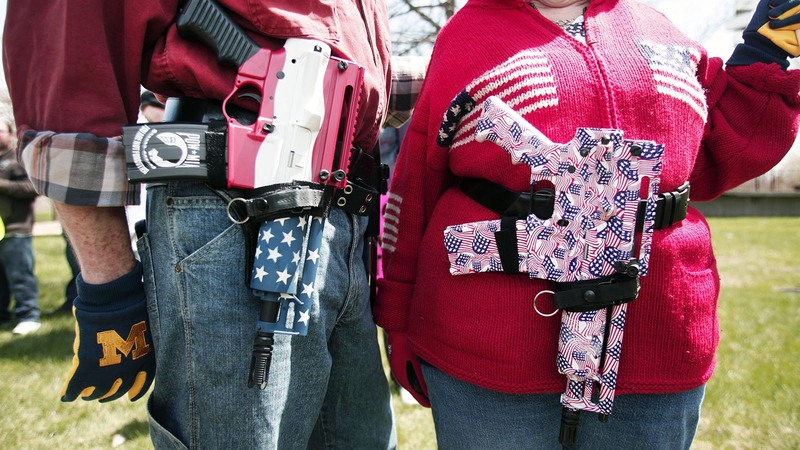 This article originally appeared in Open Culture. Absolutely amazing….”Gleefully dabbles…”???!!! wow. And yet, far from the Keane’s San Francisco, and perhaps as far as a person can get from Margaret’s frustrated acquiescence, we have Frida Kahlo creating a body of work that would eventually overshadow her husband’s, muralist Diego Rivera. Unlike Walter Keane, Rivera was a very good painter who did not attempt to overshadow his wife. Instead of professional jealousy, he had plenty of the personal variety. 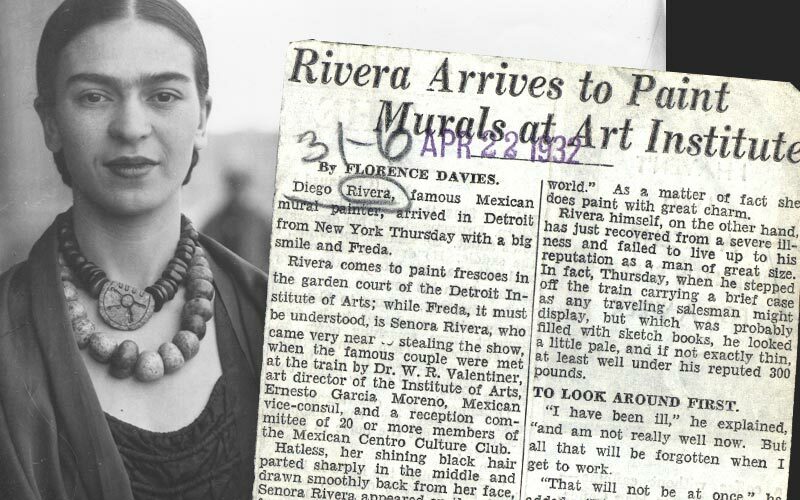 Even so, Rivera encouraged Kahlo’s career and recognized her formidable talent, and she, in turn, supported him. 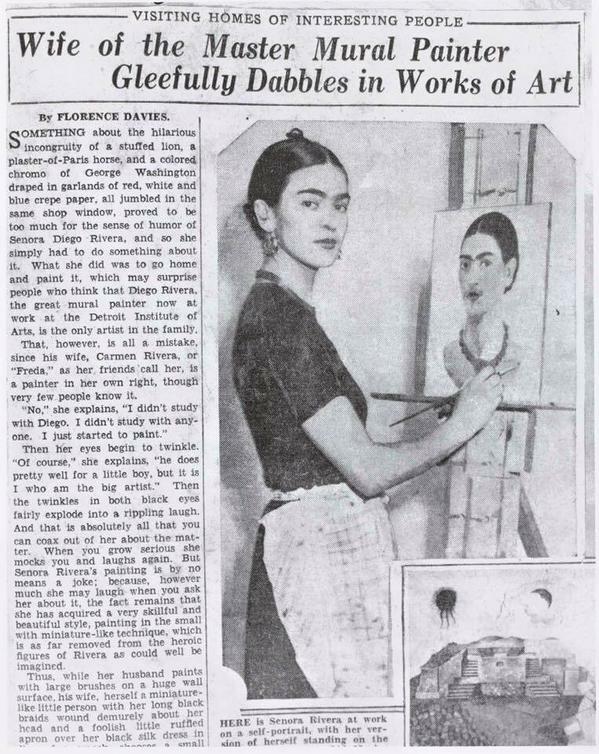 In 1933, when Florence Davies—whom Kahlo biographer Gerry Souter describes as “a local news hen”—caught up with her in Detroit, Kahlo “played the cheeky, but adoring wife” of Diego while he labored to finish his famous Detroit mural project. That may be so, but she did not do so at her own expense. Quite the contrary. Asked if Diego taught her to paint, she replies, “’No, I didn’t study with Diego. I didn’t study with anyone. I just started to paint.’” At which point, writes Davies, “her eyes begin to twinkle” as she goes on to say, “’Of course, he does pretty well for a little boy, but it is I who am the big artist.’” Davies praises Kahlo’s style as “skillful and beautiful” and the artist herself as “a miniature-like little person with her long black braids wound demurely about her head and a foolish little ruffled apron over her black silk dress.” And yet, despite Kahlo’s confidence and serious intent, represented by a prominent photo of her at serious work, Davies—or more likely her editor—decided to title the article, “Wife of the Master Mural Painter Gleefully Dabbles in Works of Art,” a move that reminds me of Walter Keane’s patronizing attitude. Wound up week 5 of my songwriting class last week and am going into the sixth week with the lyrics to my C&W tune coming along pretty well. I really enjoy this Berklee College of Music class. The teacher is an old pro and very witty and we’re all having a lot of fun with it.